Serviceability of the TB250-2 is easy to perform due to the large hoods, which open overhead providing access to key daily inspection points, pattern change valve, selector valve, control valve, battery and toolbox. 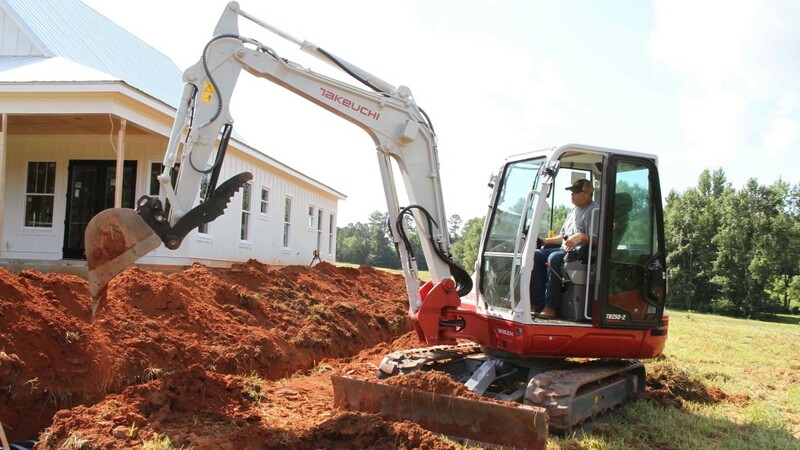 Features on the excavator include a long arm with integrated thumb mount and a max dig depth of 12 feet 4.8 inches. Takeuchi Fleet Management telematics system or TFM comes standard on the unit. This system allows the owner to view machine vitals, location, utilization, performance and maintenance data remotely and can be instrumental in ensuring machine uptime and availability. A four-pump hydraulic system provides exceptional multi-function capability and precision pilot joysticks deliver smooth, metered control. The TB250-2 is also an excellent attachment platform. The primary auxiliary circuit delivers 24.2 gpm and is controlled using a proportional slide switch located on the left hand joystick. The multi-function monitor makes it possible to adjust hydraulic flow rates from the cabin, and multiple presets allow attachments to be exchanged quickly and easily. Additionally, detent mode provides continuous oil flow for various types of hydraulically driven attachments helping to improve efficiency and reduce fatigue. Not only will the operator be more productive with this machine, but also more comfortable in the spacious cabin. The automotive-styled interior is equipped with a high capacity HVAC system to keep them comfortable throughout the year and rocker switches provide a wide range of functions. Easy to read in varying light conditions, a large multi-function monitor keeps the operator informed of machine health and performance. The deluxe high back suspension seat features multiple adjustments for height, weight, fore and aft positions and tilt for greater comfort and customization. Serviceability of the TB250-2 is easy to perform due to the large hoods, which open overhead providing access to key daily inspection points, pattern change valve, selector valve, control valve, battery and toolbox. All grease points are clearly marked and easy to locate down one side of the machine. The fuel fill is located behind a lockable access panel and features a site gauge to simplify refuelling. "Takeuchi is excited about the addition of the TB250-2 to the excavator line, and we look forward to providing today's contractors with a machine that will meet and exceed their expectations on the most demanding jobsites," says Mike Ross, Director of Product. "Listening to our customers is key to our success and we incorporate that feedback into each and every Takeuchi product to ensure the build quality, performance and value is unmatched." The TB250-2 excavator is now available.